We’re Sick. See Doctora. 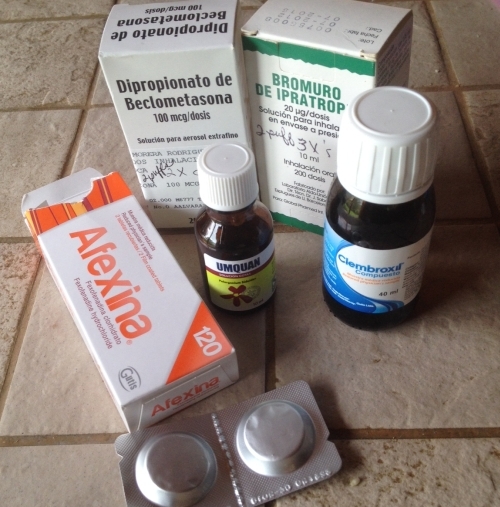 See Farmacia. Get Drugs. 30 Minutes. Nancy got sick last week. Coughing, sneezing, wheezing, low-grade fever, sore throat, achy. Living in the old country we would have never bothered to go to the doctor for these symptoms. First, it would take three days to get an appointment, we would sit in the waiting room for another three days, then get a ‘scrip and wait in line for three days at the pharmacy. But Monday a week ago when Nancy got sick, we called Doctora Candy, she said to come right in. She gave her an antibiotic and cough medicine and a steroid. Three days later Dra. Candy Facebook messaged her asking about her health. She wasn’t better so Dra. Candy said to come right in. She gave her two inhalers and prescriptions for phlegm releaser, cough suppressant, and a strong antibiotic by injection – one shot every day for three days. I caught her crud, albeit a milder case, a few days later and Dra. Candy checked me out on our second visit for Nancy. I came home with a decongestant and a liquid for respiratory problems. Walk in, get diagnosed, get drugs. There are a lot of people who don’t like to take drugs. If we are sick, we like science to help us feel better. Sorry you’re sick. I’m with you on the drugs: Better living through chemistry!